Every player with a ball. 1-If tagged player has to stand frozen with their legs open and another player has to play the ball through their legs to be unfrozen. 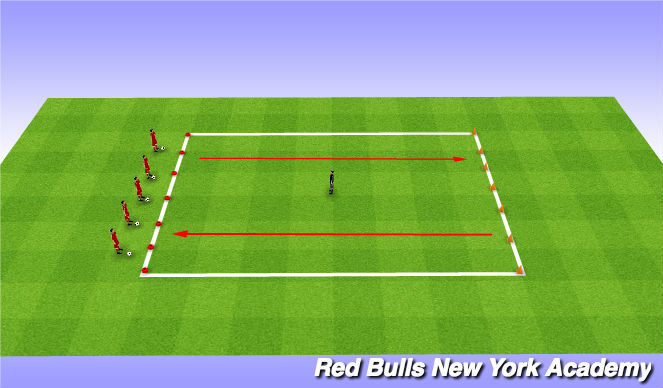 2- Players can perform a skill once tagged (toe taps/box touches) to unfreeze themselves. Red Cones on one side to represent starting point (home) and orange cones on the far side is the end zone "
Improve motor skills and have kids work on stopping their body immediately. Close control with their ball during each time across the grid. The Ghostbuster (coach) must try to make the city safe again by ridding the streets of ghosts by shooting them with his ghostblaster (striking his ball at the players hitting their knee or anywhere below). - Try to get as close as possible to a Ghost before shooting your blaster. - Make sure you know where in the city to look for the Ghosts are by looking up. - Try to make sure you aim for a Ghost and not just shoot your blaster when you can as it may end up in the other side of the city and take a long time for you to get it back. Organization: 2 goals on each pitch sperated by a line of cones. Play 3v3/4v4 using age appropriate goals (no GK&apos;s) in a 20x30/25x35 yard area. Restarts are always made from the coach who has as many balls as possible around him, if the ball goes out a new game ball is immediately played in. The game is continuous (no stoppages for throw ins, corners etc.) until the players need a water break or the coach runs out of balls.